Few garden crops rival the perfection of crisp peas in late spring. Getting them started early is the secret, as they prefer to grow in cooler temperatures. Read in “Peas in Particular” to see a foolproof way to beat cold weather, critters, and rot. Since writing that article a few years ago, I have become more sophisticated and now use well-draining trays for my damp vermiculite instead of milk cartons, on a heat mat with grow lights suspended from the ceiling; faster and easier, in limited space. I currently let them get to about 4” tall before planting outside, as the starch is used up from the seed, and the varmints aren’t so interested in this ‘food source’. I am careful to harden them off before moving them out to the cold. Don’t have a heat mat and grow light? Peas aren’t fussy, they are fine at room temperature, but will be slower. Once germinated, they don’t need heat, so a cool greenhouse, sunroom or even outside in a spot protected from weather and predation is fine. At this stage bright light is paramount. We are often asked “What is the difference between Snap peas and Snow peas?” It’s hard to remember which is the flat one and which is the one with peas in it? The way I remember is that snow lies flat on the ground, and Snow peas are the flat edible pods. Snap peas, aka Sugar Snap, have fully formed peas inside. Both kinds have edible pods, ‘mangetout’ or ‘eat it all’. While I’ve always grown both Tall Telephone and Sugar Snap Pole (in the ground at home, and in large pots with bamboo poles at the nursery), another option is to grow dwarf peas, not needing a trellis. Allegedly they produce more peas per square foot, and would be ideal for smaller gardens, patios and balconies. Plant them in a block, not in rows, so you can just reach down into the branches and harvest. I’m trying Little Marvel at the nursery in a large pot, planted densely all over the soil, with pretty red Cornus twigs to give them something to climb on. Come and check out their progress! 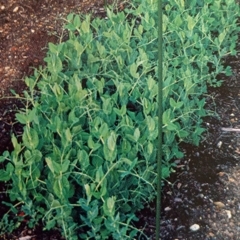 Some of the many good varieties of dwarf peas are: Sugar Ann, Little Marvel, Sugar Lace II, Lincoln Homesteader, Dwarf Grey Sugar.